I hope to see you all there, let me know if you going to make it and I’ll keep an eye out for you! The event is FREE but please sign-up RSVP Here. A two-day conference on September 12 & 13 and a performance series will accompany the exhibition. 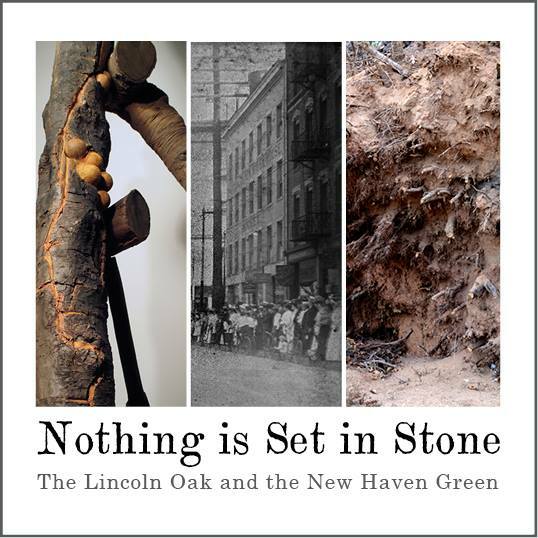 I have collaborated with Dr. Gary Aronsen Ph.D (Research Associate, Anthropology Laboratories at Yale University) in installing my 3 channel projection and sculptural pieces of Shrine of the Common & Undivided Land with his research addressing the bodies found under the Lincoln Oak Tree after its fall on October 31, 2012 on the New Haven Green. This installation is divided between this exhibit and the one currently showing at the New Haven Museum in the Nothing is Set in Stone. Artists and contributors include: Brad Armstrong, Ricardo Miranda and Brooke Singer; Lani Asuncion and Gary Aronsen; Mengyu Chen; The Elm City Dance Collective; Jason Friedes; Focus Lessness (Michael Romano and Milton Laüfer), Occupy New Haven; Phil Lique; Project Storefronts;Scott Shuldt; and Under 91 Project. “I’m Open Come On In” by focuslessness, a daily take over of the Artspace sandwich board. View images from the project, here. The Excess Project presents a series of posters about excuses people give about not composting (designed by Jerome Harris) here. The concept of “the commons” predates the feudal era in early Germanic and Roman settlements, where communal land ownership prevailed. Originally, the concept referred to the public’s interest and right to access essential natural resources that are held in common and not owned privately, including land, water, animals and fish. Gradually, as royalty and then a central government gained power, the notion of communal land ownership disappeared and the concept of “the commons” evolved. This exhibition presents a group of artists, based in and around greater New Haven, who make works that operate within the penumbras and cracks of the legal systems that oversee its “commons”. These grey zones are the flexible and the often vague environments from which the show’s title takes its inspiration. 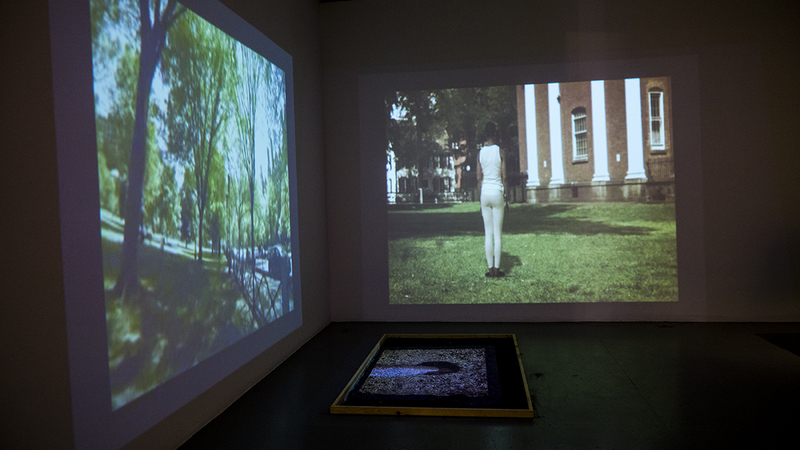 The show identifies four specific sectors and human rights questions addressed by artists practicing in and around New Haven. These include: the material commons (who has the right to order the build and name structures, homes, cities, maps? ), the knowledge commons (who has access higher education, public libraries, the internet? 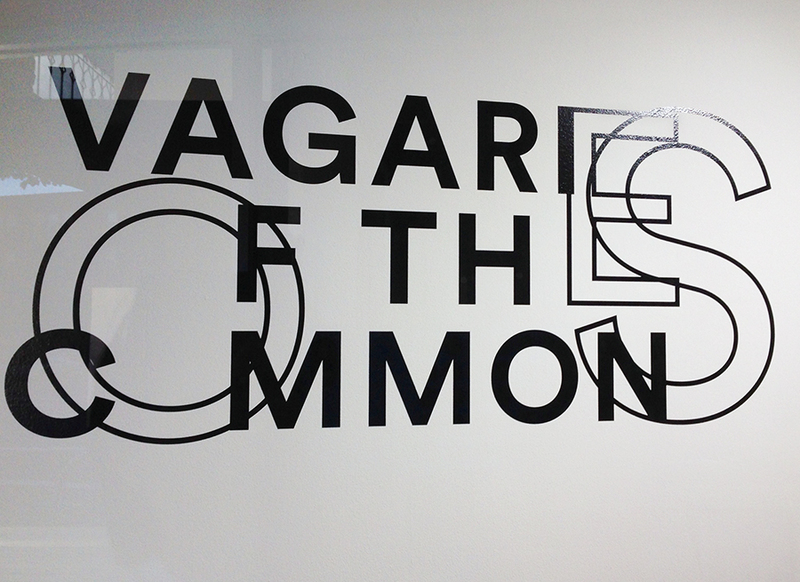 ), the aesthetic commons (who has the right to define and control image production?) and the affective commons (how are emotions policed and kept public/private?). The essential question that each work asks is: who has the right to have a voice? 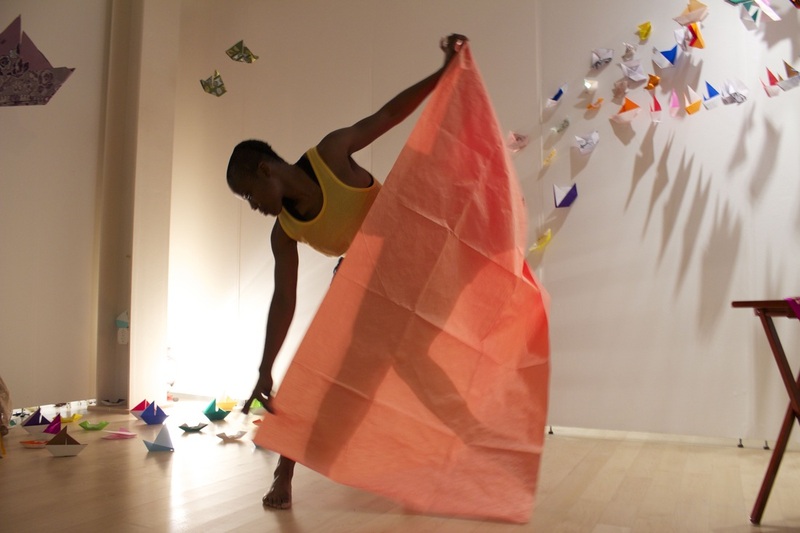 This summer artist OluShola Cole will be my Summer Intern & Studio Assistant. We are woking together to create a balanced working schedule that enables me to get the assistance needed in the studio and on the field, but also cover aspects of video production and other multi-media skills she is interested in exploring further. 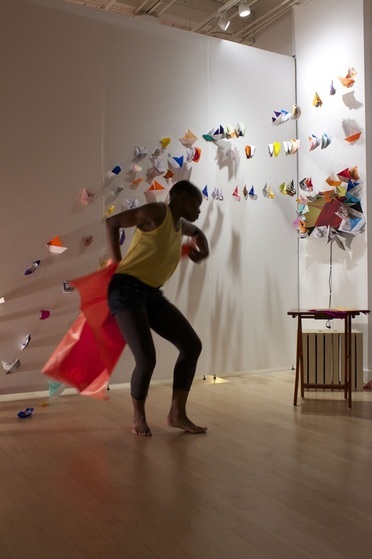 Next semester Shola will begin her 2nd year of studies in the Mount Royal Interdisciplinary Masters program at Maryland Institute College of Art (MICA). She is working in mixed mediums of performance, video, movement, installation and sound, embodying the research of integrated pirate and slave communities through a cultural and expressive lens in her work Jenny.Was.A.Pirate.Hater watch a video of her performance here. Currently she is assisting me with the production of and performing in a new work that will be exhibited in ‘Vagaries of the Commons‘ at Artspace showing July 25 – September 13, 2014 curated by Sarah Fritchey. She will also be helping me prepare pieces I will use in the new 3 SISTERS: SustainABLE video in produciton during an upcoming artist residency in July at Elsewhere Living Museum in Greensboro, NC. It is nice to have the chance to share my skills and technique with another artist and see how she will implement these things within her own work. I hope this will be the beginning of a long thread of working together on many more projects and collaborations in the future. 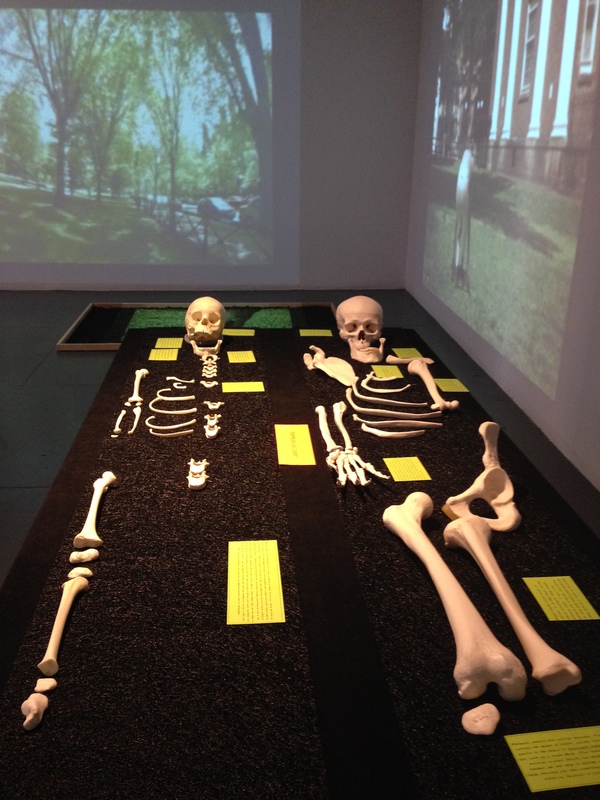 In October 2012, winds from Hurricane Sandy toppled the Lincoln Oak, revealing a partial human skeleton among the tree’s exposed roots, along with two buried time capsules, creating an enigmatic story that captured the imagination of the entire country. 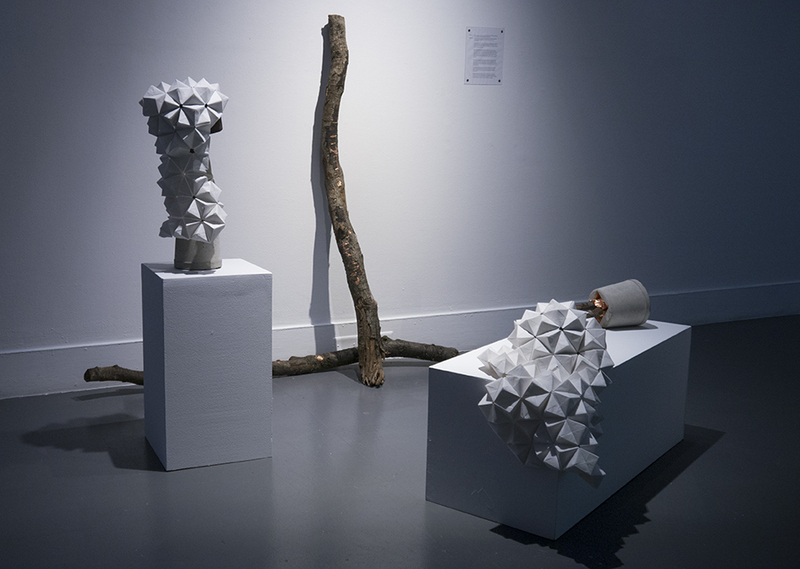 For the artistic portion of this exhibit, the artists used branches, limbs, or pieces of the trunk of the Lincoln Oak to interpret the history of the tree and the discoveries found beneath it. The exhibit also features the results of the on-going archaeological analysis of the bones and materials found beneath the tree. This includes displays of the time capsule contents, and the inquiries into the possible identities of the skeletal remains. I will be showing a new work created for this exhibit entitled Shrine of the Common & Undivided Lands which is a multi-media piece that incorporates a one-channel video Reverence and sculptural elements. Shrine of the Common & Undivided Lands is a memorial tribute to the bones found coiled within the uprooted Lincoln Tree, and all the hundreds of other bodies buried under the Green. 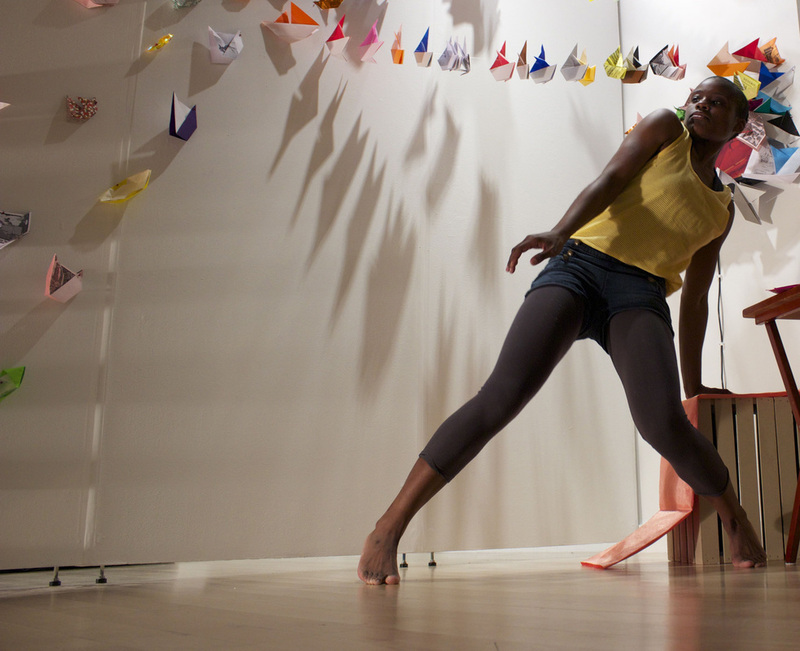 In the video Reverence, performers Kate Gonzales and Julie Riccio animate the branches of the tree with a ritual like dance. The cement sculptural base refers to the time capsules found under the tree with a portion of one that was casted into the bone remains of a child and his/her marble, and the ash is derived from the branches of the tree. The large bowl within the cement base is for collecting pennies left by visitors, to show respect and remembrance.